Bestselling author, physician, and mystic Lissa Rankin, MD first discovered the Inner Pilot Light when, during one of her darkest moments, she heard a voice of pure, unconditional love. This voice was a spark of divinity—a direct channel to Source that is available to each of us whenever we need it. 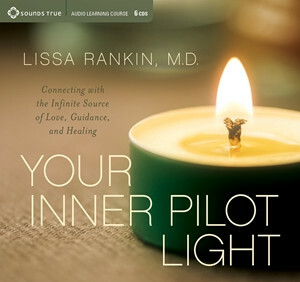 In her first full-length audio teaching program, Dr. Rankin shares inspirational stories, powerful practices, and guided meditations to help each of us access our own Inner Pilot Light. Within each of us is a spark of pure divinity, a direct channel to Source that never goes out no matter what hardships we face. Although this spark has many names in many traditions, physician and bestselling author Dr. Lissa Rankin refers to it as the “Inner Pilot Light.” In Your Inner Pilot Light, Lissa speaks with Sounds True founder and CEO Tami Simon about her own journey of discovering the Inner Pilot Light, sharing inspirational stories, guided meditations, and practices to help each of us awaken the eternal flame within. When we tend to our Inner Pilot Light—that flame of consciousness that is uniquely us yet part of a greater Divine fire—we tap into an unlimited source of wise guidance and unconditional love. In this seven-part program, you’ll learn to kindle your own Divine spark and bring greater alignment to your relationships, health, job, purpose, and more.